Less Is More is trying to get 1000 entries this week so this is my entry for that and tried to keep it as clean and simple as possible. 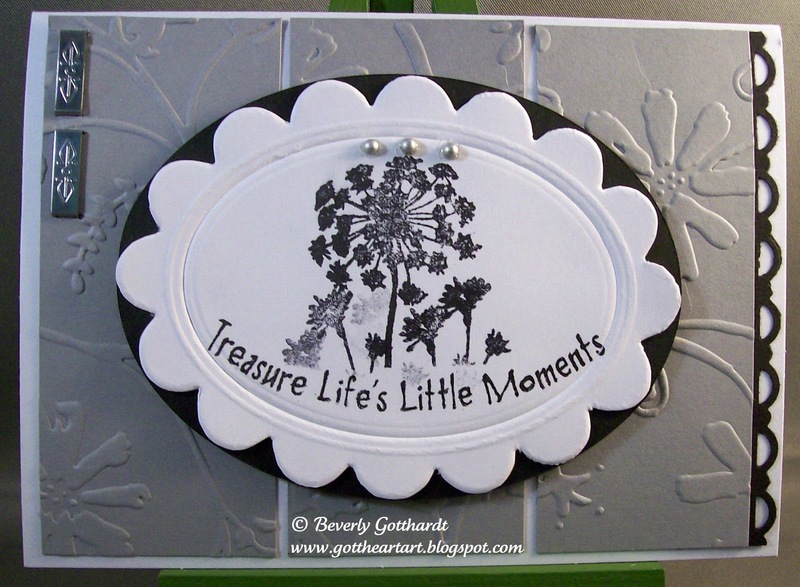 An embossing folder, a die cut with some very old staples, and a border punch lend what could be a very plain card some interest. 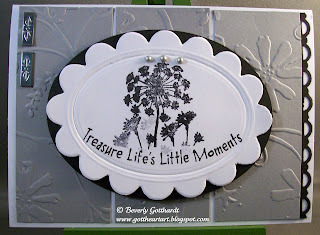 Supplies: White Card Blank 4" X 5 1/2" Halcraft, Papers: SU-Basic Black, Basic Grey, Whisper White, Stamps: CTMH-D1306 Treasure Life, Ink: Ranger Archival Ink-Jet Black, Nellie Snellen die-MFD 013, Cuttlebug embossing folder-Stylized Flowers, Fiskars shape cutter template-Ovals-1, SU-Scallop Trim border punch, EK Success fasterners, Recollections-silver dots, SU dimensionals. Thank you so much for entering our quest for 1000 entries! Beautiful image and layout! Thanks for playing with the Paper Players this week! Beautiful card! I love the embossing! Thanks for playing with The Paper Players! What a beautiful image and I love the elegant color combination! Thanks so much for joining us at The Paper Players! That silver embossing is great, it just makes the card. Love it. Thanks for having fun with The Paper Players this week! great card. love the texture. Such a pretty card! Your focal image is fabulous. Thanks so much for joining us this week at the Paper Players. What a super elegant card! Great, great use of our composition - BRAVO! Thank you, SO very much, for gracing Card Patterns with your fine creation!